Taipei, Taiwan, Apr 30, 2018—Advantech, a leading supplier of industrial communication solutions, is broadening its range of wired Ethernet solutions by launching a VDSL package, namely the VDSL extender EKI-1751 series and the VDSL module EKI-7700-2F(P)2V series. Advantech’s VDSL package enables users to reach remote places where PoE is unfeasible. This long-reach technology allows for data transmission via twisted pair and coaxial cables. It is ideal for remote areas that require Internet communication service but cable rewiring and redeployment are difficult. The VDSL extender series not only carries Ethernet communication but also extends power serving distance via twisted pair and coaxial cables. With this series, applications such as traditional parking lots, remote surveillance systems, isolated asset monitoring, and long-distance transportation routes are all free from the power barrier typical of wired systems. The VDSL module series can be plugged into Advantech Ethernet switches, bringing the functionality of such switches to remote areas. The combination of a VDSL module and Ethernet switch contributes to realizing additional management and monitoring possibilities, especially for intelligent transportation systems as well as environment and energy industries. The EKI-1751 and EKI-7700-2F(P)2V series are now available. 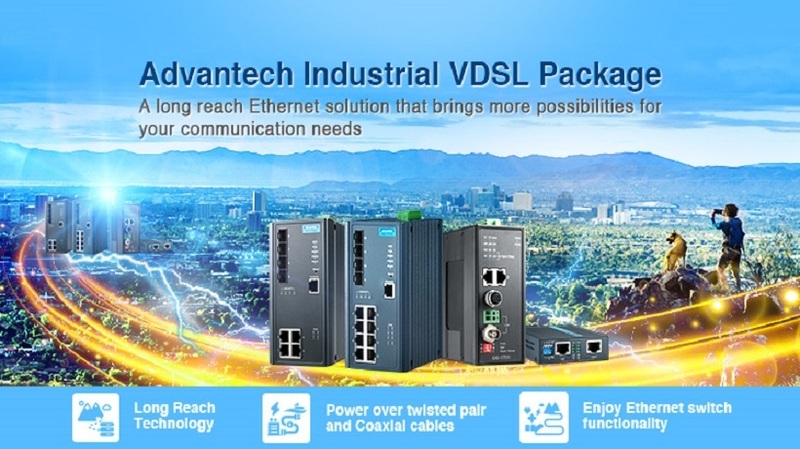 For more information on the product specifications and how the VDSL package can benefit users, please visit the Advantech website.